Experience outstanding power, comfort, convenience and style with Kubota’s RTV-X1120 Series range. 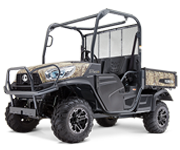 Powered by Kubota’s rugged 24.8HP diesel engines, exclusive Variable Hydro Transmission (VHT-X) and alloy wheels. Body available in Kubota’s signature orange or camo.